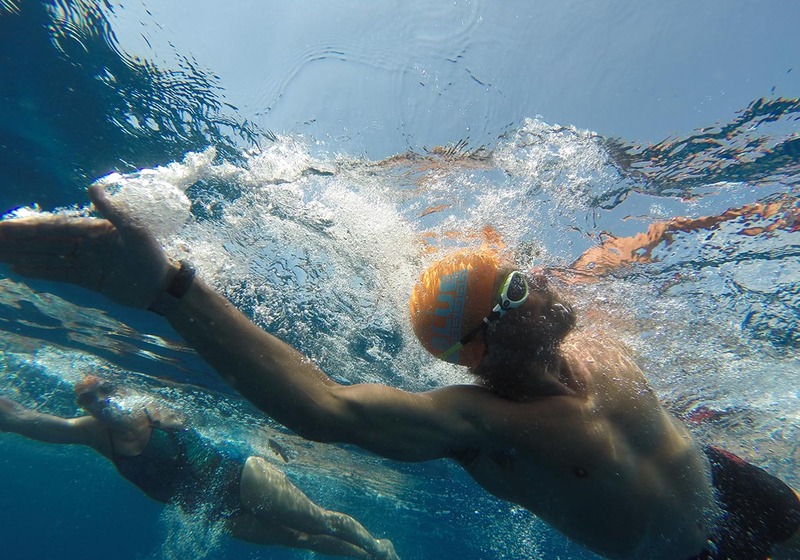 Following the success and popularity of the longer swims The Big Blue Team is very excited to offer once again The Big Swim Week, which will run around Lefkada island on 22nd September to 29th September 2019 at a very special price of £840 per swimmer! For this we have plotted some exciting long swims over and above the routes we take on our ‘normal’ weeks. The daily swims average a distance of 7K and the week is geared towards the slightly more experienced open water swimmer. 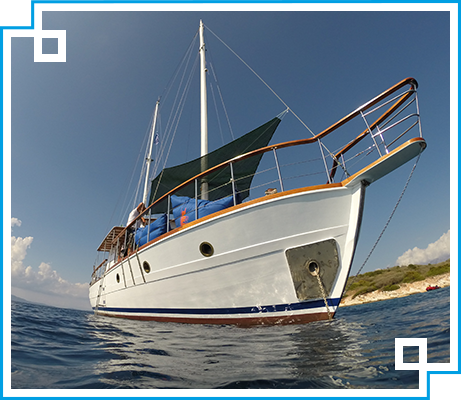 This time we have introduced unique routes that link the island of Lefkada to mainland Greece with a mixture of coastal swims and island crossings. The Big Swim Week will take place towards the end of September and as usual will start and finish on a Sunday. 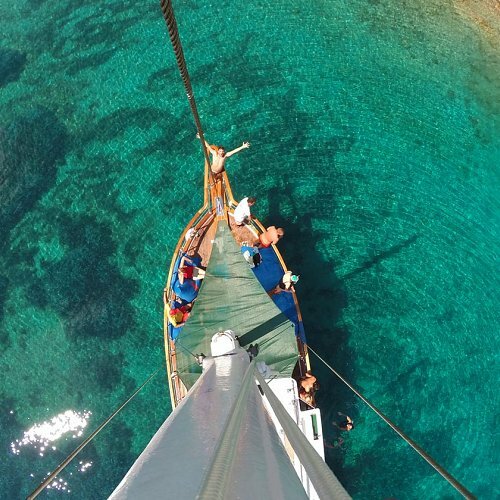 Safety measures in place will include brightly coloured support ribs with 3 fully qualified guides as well as a captain and of course the Queen of the Ionian Sea, Mowgli, our main traditional sailing boat, offering comfort, speed and ample lounging space on her teak deck for relaxing and sunbathing. 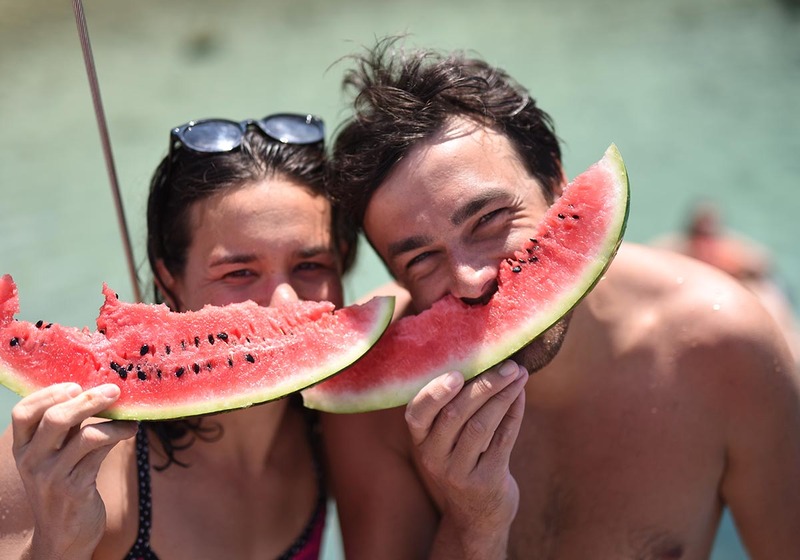 With lunch stops at a different fishing harbour every day for delicious, freshly prepared local Greek specialities, this week promises to be memorable for all those out there who have a real love for open water swimming. 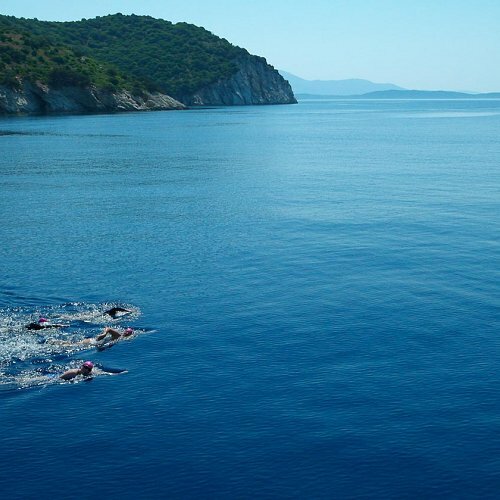 On the general map of the area you will be able to locate these longer swims which average 7K/day, concluding with the fantastic 7K Kefallonia to Ithaca ‘heroic’ swim – go big and be part of it. Swimmers also have the chance to swim in the nearest bay, Desimi Bay, about 30 mins walk from the hotel, which would be their own responsibility, outside the remit of The Big Blue Swim. 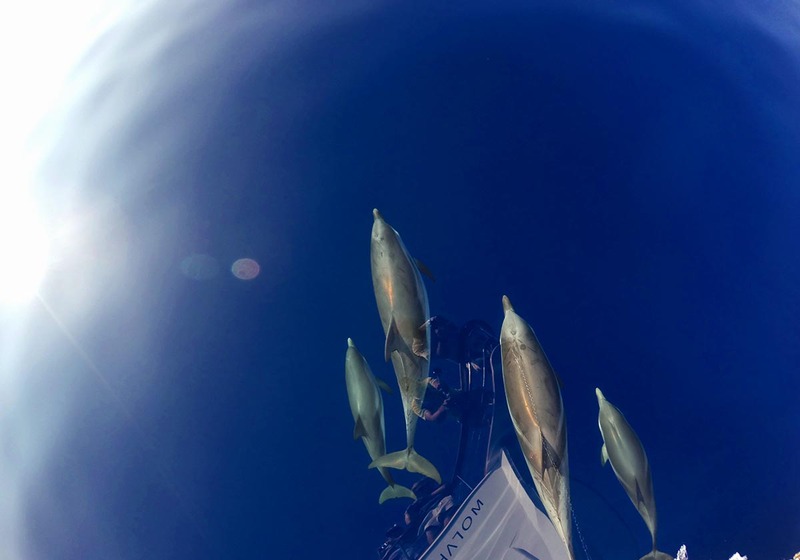 Swimming in the bay where Ilios Hotel is located is not recommended due to boat traffic. 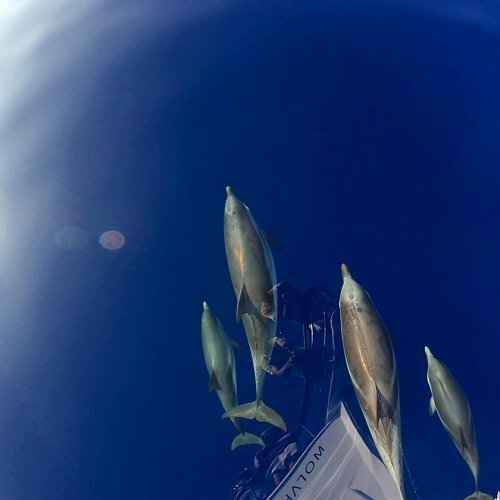 Today kicks off with an initial open water acclimatisation swim and optional swim video session and your chance to meet the azure hues of the Ionian. Our qualified coaches and guides will split the week’s swimmers into 3 speed groups, will then film each swimmer and later provide feedback and analysis on technique. 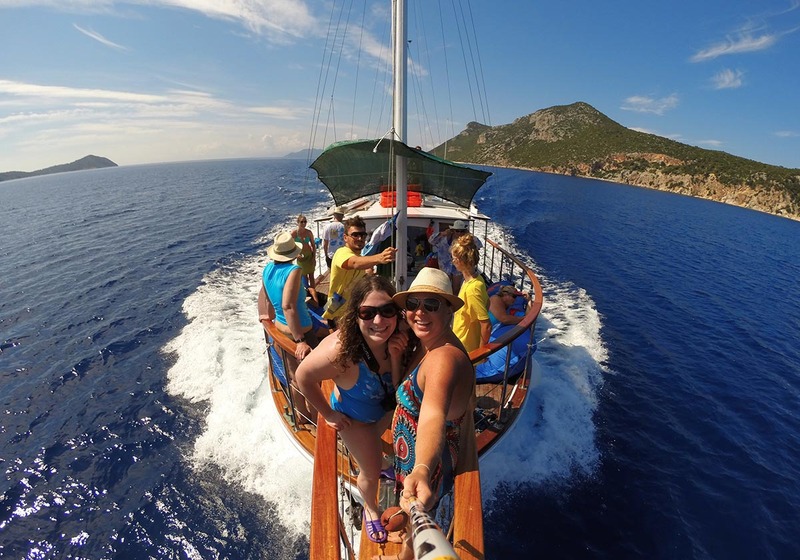 We then board the boat and journey east to the island of Meganisi, with its impressive lace-work of coastline that forms deep enticing coves. 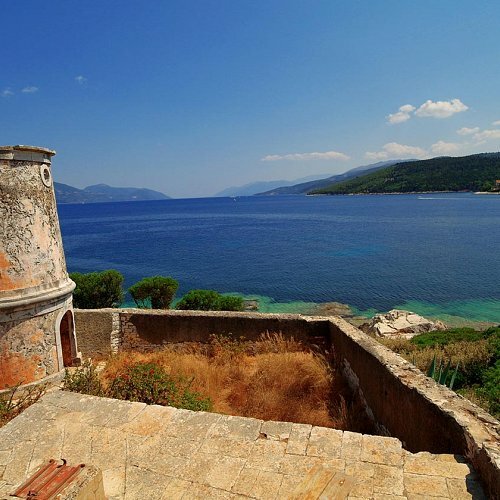 According to myth in ancient times the island belonged to King Tafios, the son of Poseidon God of the sea and it was here that Odysseus left his boats before he travelled to Ithaca. 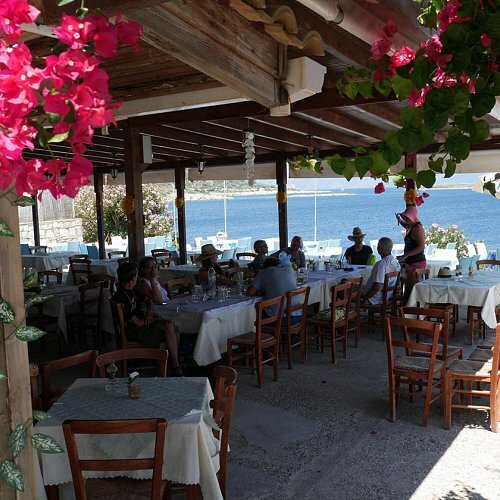 On Meganisi we will moor at Vathi, a picturesque village harbour, where we will have a leisurely light lunch at a traditional taverna overlooking the harbour and a chance to relax and practise your Greek with the locals. 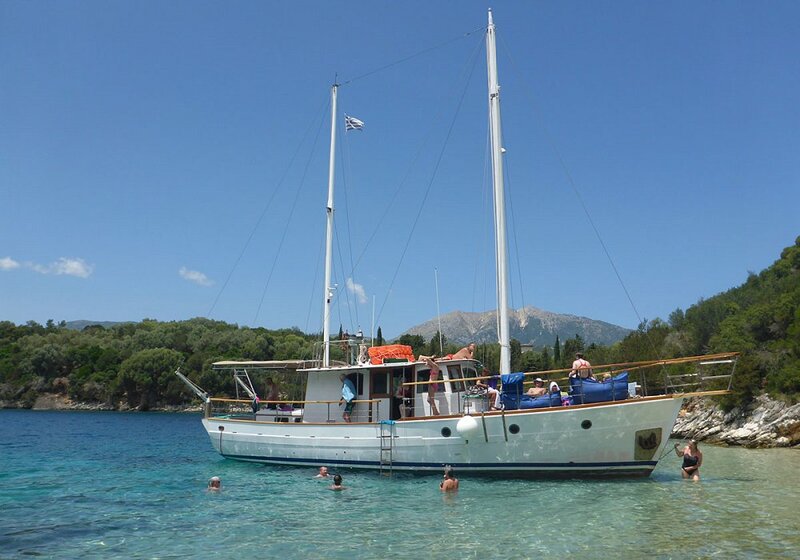 The afternoon involves a short boat ride to Port Atheni where we start our 2.2k swim following a north easterly direction along the scenic winding coastline, finally crossing to the uninhabited islet of Megalo Nisopoulo with its clear blue water. Daily swim total: 2.7k approximately (swim route and acclimatisation swim). Today we will experience three very different islands. 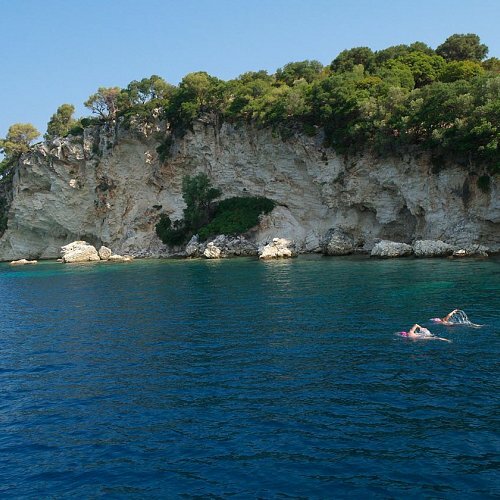 We first take a 45 min ride to visit the famous cave of Papanikolis on Meganisi for a unique snorkelling experience. We then board the boat and go down the coast to the start of this morning’s swim. 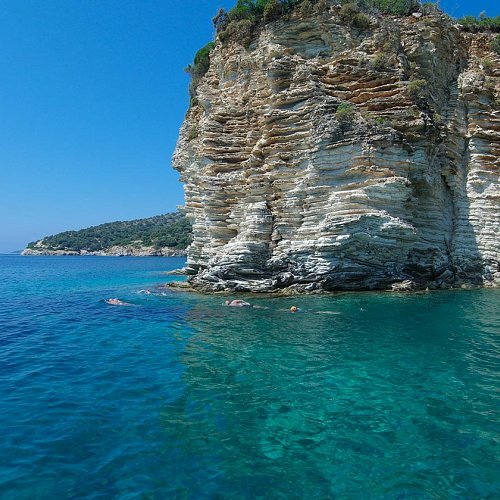 We follow a route down this scenic sculptural coastline exploring the numerous caves and small bays only accessible by sea and we then make the crossing to the small island of Kithros; we then swim along its stunning rocky coastline where the 4k swim ends. 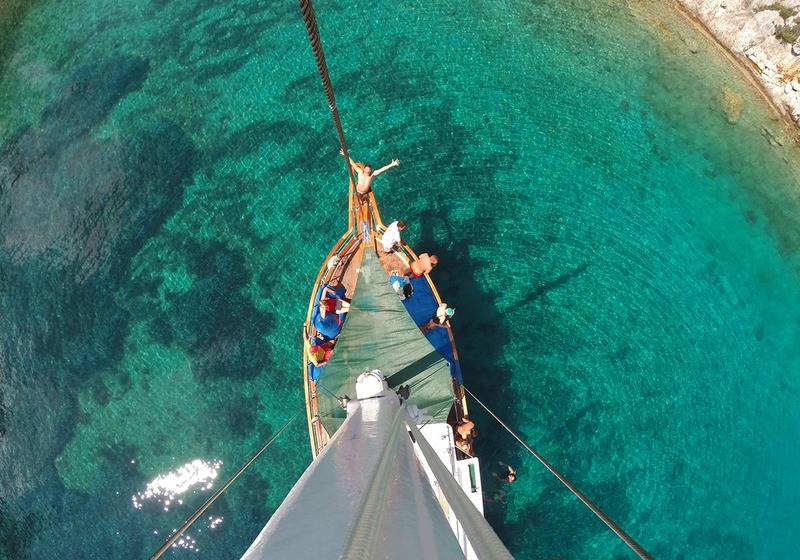 Next we board Mowgli and travel east to Kalamos island famous for its unusual mix of maritime pine trees, olive trees, arbutus, Monachus seals and derelict wind mills. 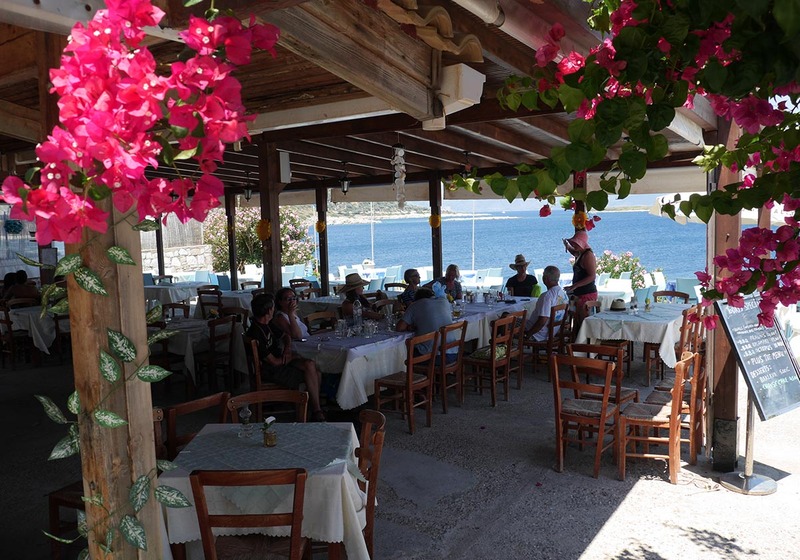 We dock on the east side of the island at the crescent shaped harbour and have lunch in a traditional taverna. After lunch a chance to explore, relax and have a coffee. The afternoon 3k swim starts from the north tip of Kalamos where we swim across the channel to land on a small beach on the Greek mainland. 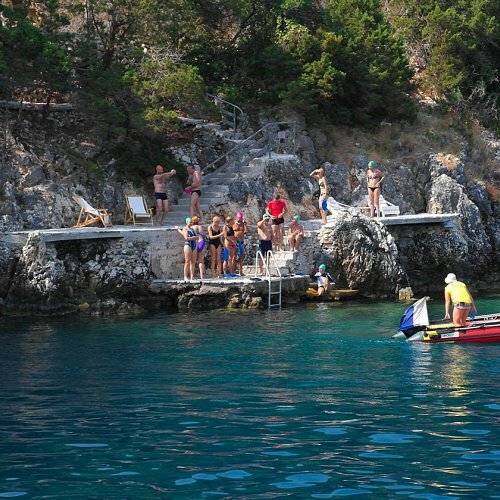 You can now tell people you have officially swum from Lefkada to Greece! Location: Kithros, Meganisi, Kalamos and mainland Greece. 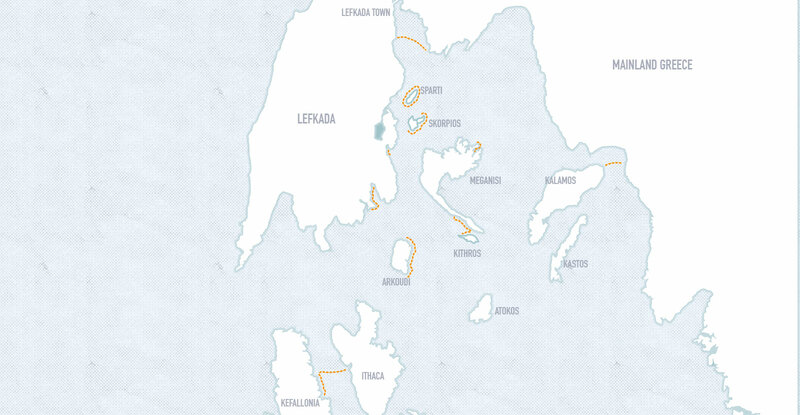 We will start this 4k swim from the south tip of Arkoudi; we will follow the coastline round anti-clockwise and finish on the north point, which is half way across circumnavigating the island. Then onto the beautiful bay of Sivota where we rest and lunch in one of the many tavernas in this colourful harbour; a chance to buy souvenirs and replenish personal supplies. The afternoon 3K swim starts at the next bay, in the turquoise waters of Mikros Gialos beach. We hug the coast, swim around the peninsula and finish on a secluded beach where we moor for a short while for snacks. 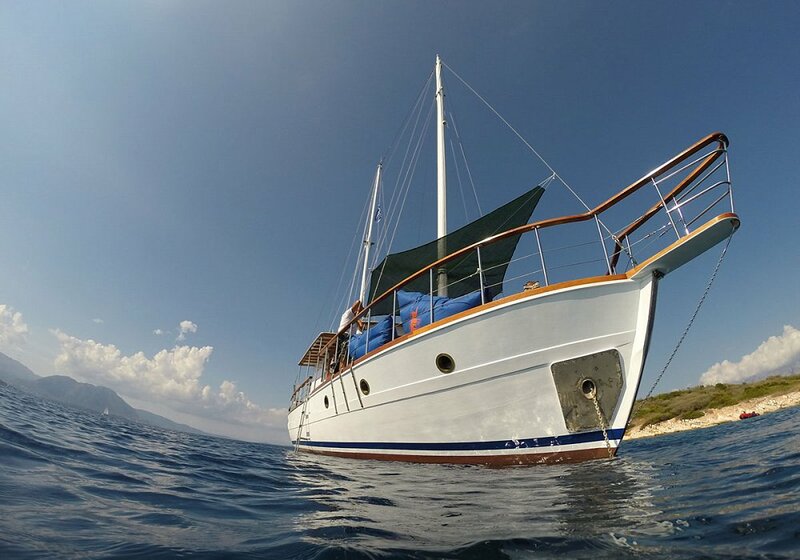 Today starts with a short boat ride to Nikiana on the east coast of Lefkada, further north from Nidri. From the small traditional fishing harbour of Nikiana it is clear to see the Greek mainland opposite, separated by a channel. Today’s swim involves swimming from this fishing harbour to the mainland and landing at the southerly point of the coast, 3.6K away. 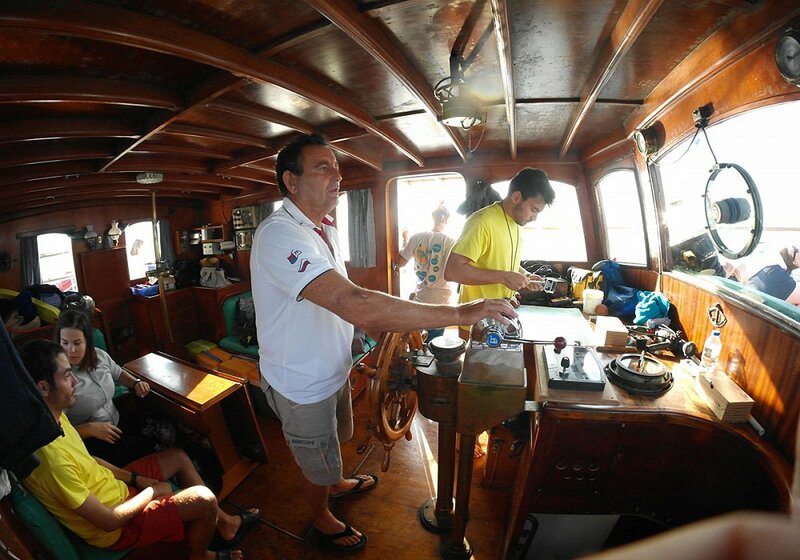 After this big swim it is all aboard the boat and back to Nikiana fishing port to taste the local food. This afternoon’s swim is the Spartan Swim!! We the take a short boat trip to the small local lush green island (Part of Lefkada’s Princes Islands) called Sparti, situated off the coast of Lefkada, after Heloni Island (Turtle Island). It is a 3.4K swim starting at the north east mooring bay on the island and swimmers complete almost a whole circumnavigation of the island ending up back in the mooring bay. 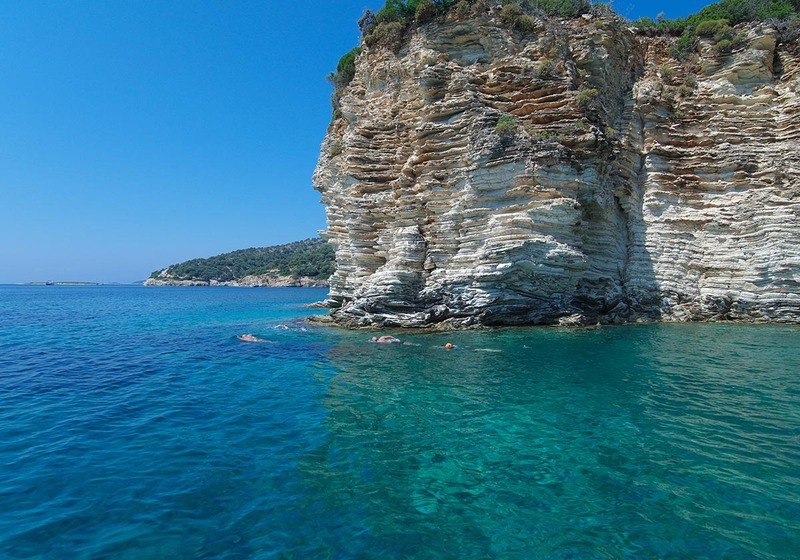 The rocky coastline of Sparti offers interesting underwater seascapes and snorkelling possibilities. 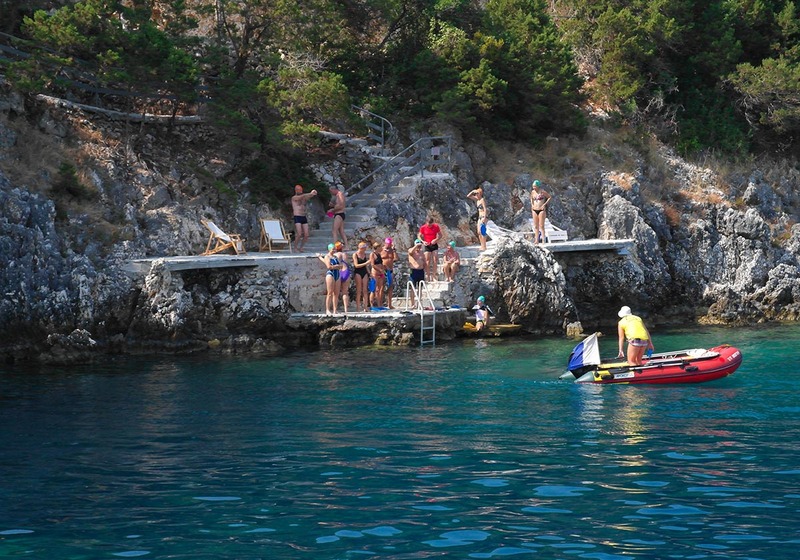 Type of swim: Coastal and mainland to Lefkada crossing. Location: Nikiana Harbour on Lefkada, Island of Sparti. 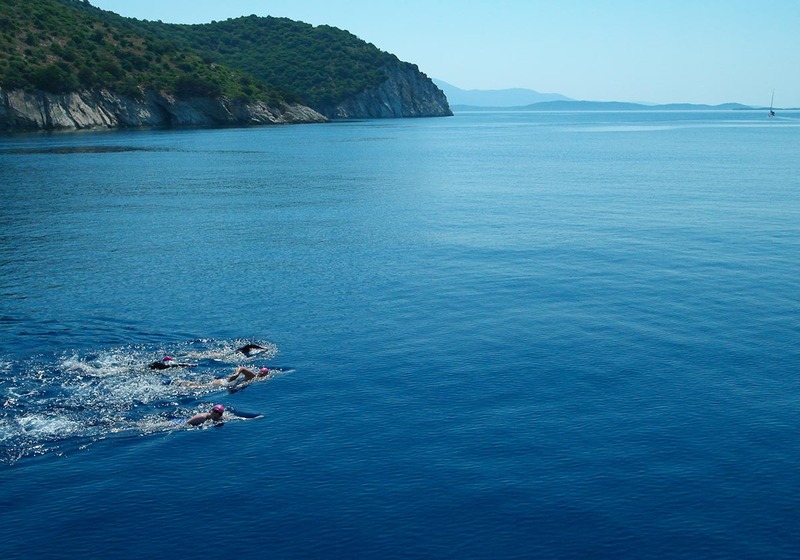 The swim starts off the east coast of Kefallonia, following a northerly direction and hugging the coast. 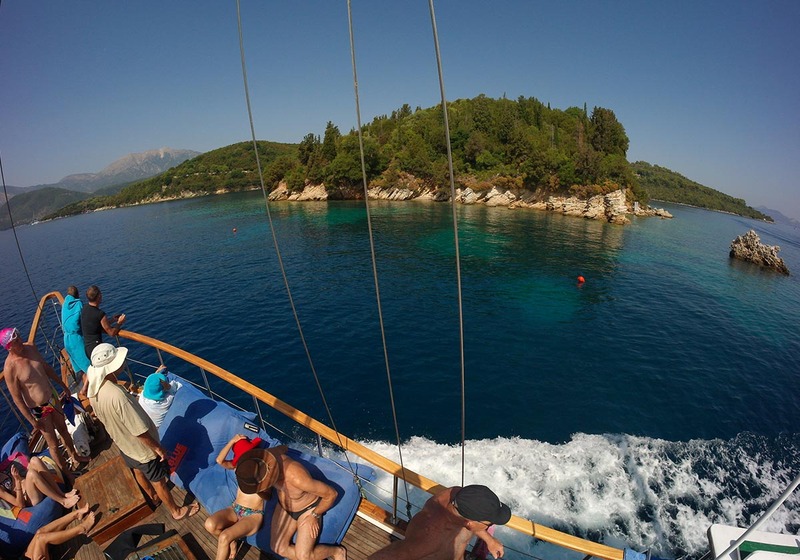 We then commence the crossing to Ithaka passing alongside the tiny island of Daskalio, mid swim. This channel of water is breathtaking and also is home to the ‘Delphinus Delphis’ Dolphins who are unique to the area between Lefkada and Kefallonia. We aim for the quiet confines of Polis Bay on Ithaka where we land after this ‘heroic’ crossing for a well deserved rest and refuel. The coastal and crossing combined are 7K long. We then go back to the boat and cruise north west to the fishing harbour of Fiskardo on Kefallonia. This is a cosmopolitan harbour and we stop here for lunch, a long break and a chance for sightseeing and coffee. 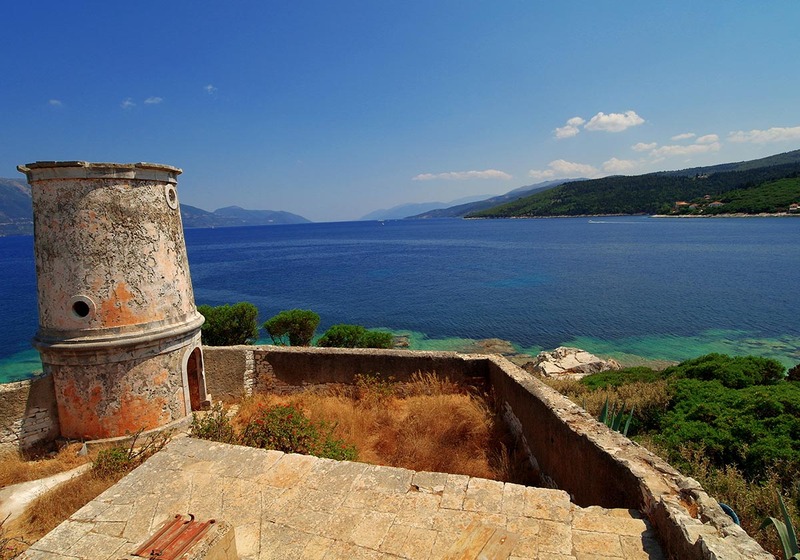 For those of you with a lot of energy left, we recommend a walk around the harbour and through a secluded wooded area to visit the old Venetian stone lighthouse. 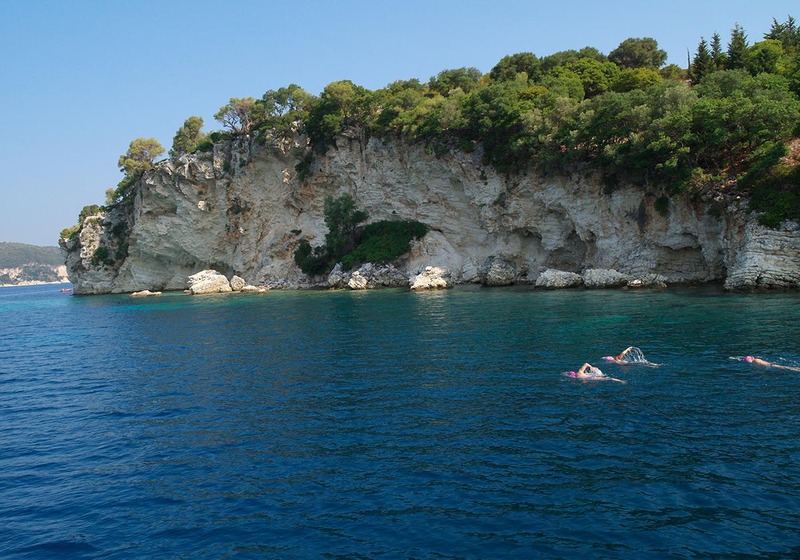 From here there are amazing panoramic views of the morning’s swim from Kefallonia to Ithaka. We then depart Kefallonia, heading North East back to Lefkada. Today’s last swim is a special one and we start the journey from the north tip of Skorpidi (small Skorpios) island. 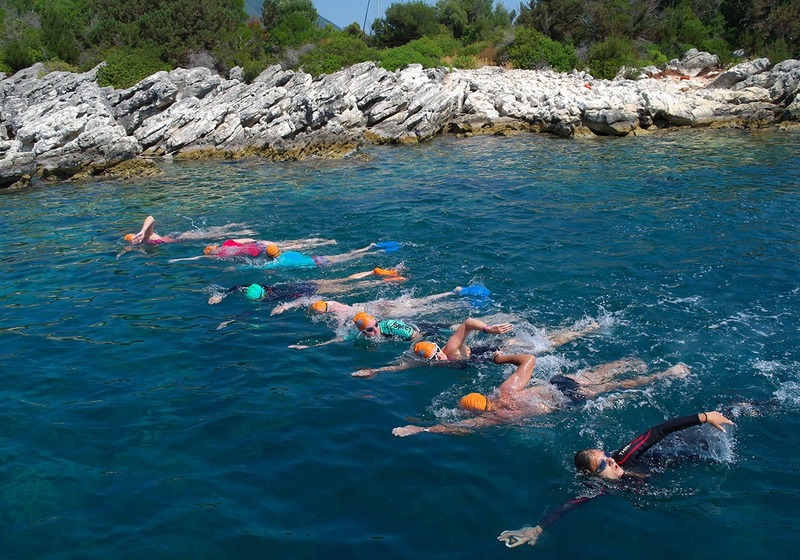 This 3K swim sees us head south east to the island of Skorpios owned by the Onassis family, starting with a small crossing first. The swim will end on a ‘permitted’ beach on this privately owned island for relaxing and photographs. The island was, until very recently, owned by Aristotelis’s granddaughter Athina Onassis. 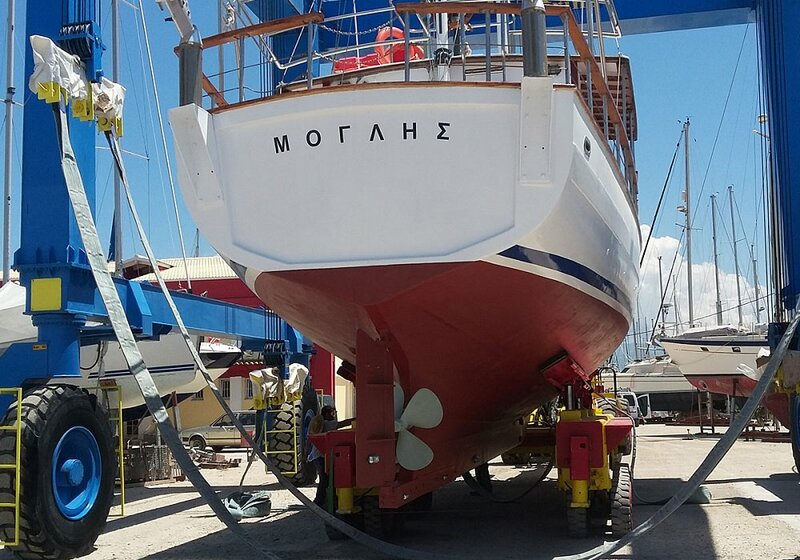 She is the only remaining ‘Onassis’ from the era of the Greek shipping tycoon Aristotelis Onassis. Nowadays the self-made millionaire as well as his beloved son Alexandros and daughter Christina are at rest on the island. 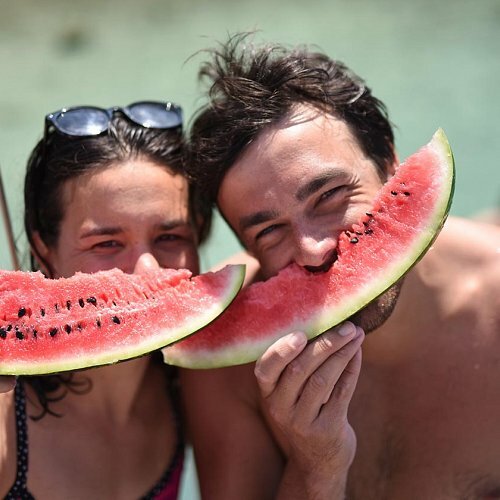 Although privately owned we can spend a short while on this very small beach for drinks, snacks and a rest, admiring the lush greenery and calm of this beautiful island. The guided swims end this lunchtime and there is the option to visit the busy town of Nidri for shopping, strolling and lunch! 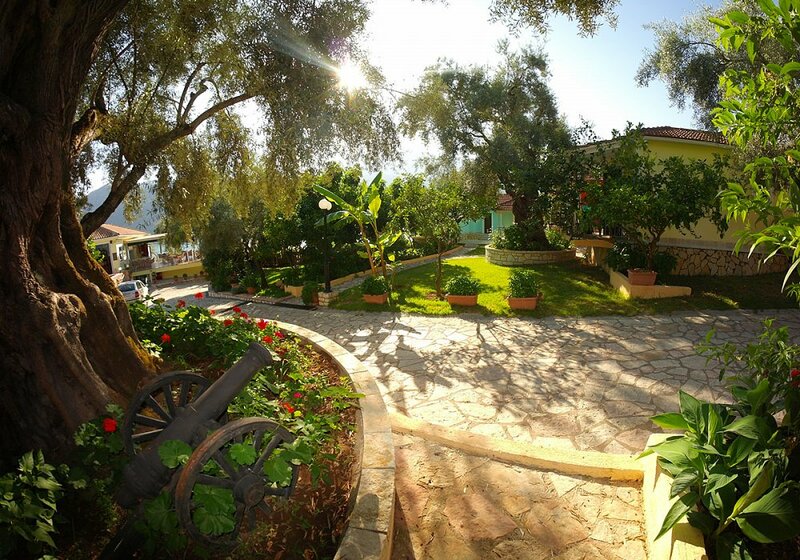 Alternatively you may wish to relax and soak up the sun in the tranquil setting of Ilios Hotel. 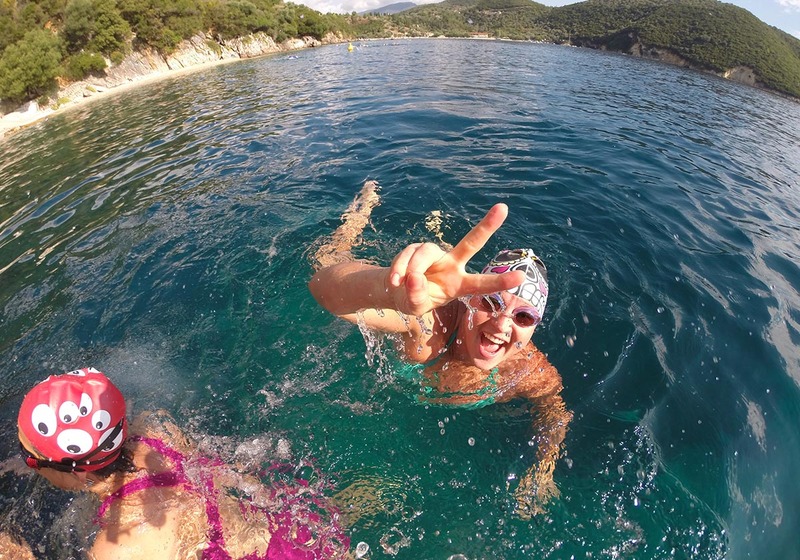 Type of swim: Coastal and island crossing. Flights that feed Lefkada island land at Preveza airport (Aktio) which is 25 minutes away by car from Lefkada Town, the capital and about 50 mins away from our hotel. International charter flights operate from May to October and connect most major European cities and capitals. From the U.K the feeding airports are that of Gatwick, Manchester and Birmingham and usually operate on a Thursday or Sunday, there and back. The typical operators are Monarch, Torair, Thomas Cook, Thomson, Olympic Airlines and EasyJet. Ryanair operate flights to neighbouring Corfu and Kefallonia; there is a local plane skyexpress that flies between Corfu, Kefallonia and Lefkada (Preveza). Skyexpress flight timetables are released in May of each year. Alternatively from Kefallonia you can catch a ferry from Fiskardo (North Kefallonia) to Vasiliki (South Lefkada) and then a bus to Nidri, approx. 20 mins away. The ferryboat ‘Captain Aristides’ operates a service to and from the Islands of Kefallonia (Fiscardo). The ‘Captain Aristides’ carries both cars and foot passengers. 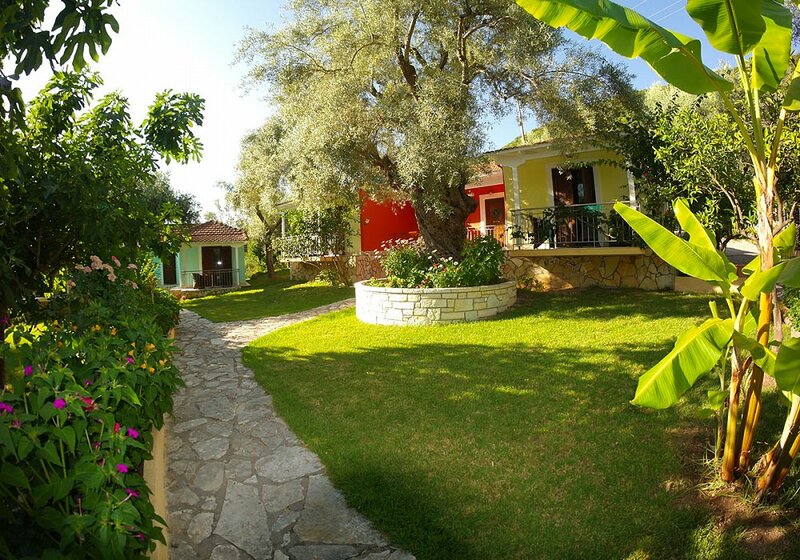 The phone number of their agent on Lefkada is + 30 (26450) 93278. 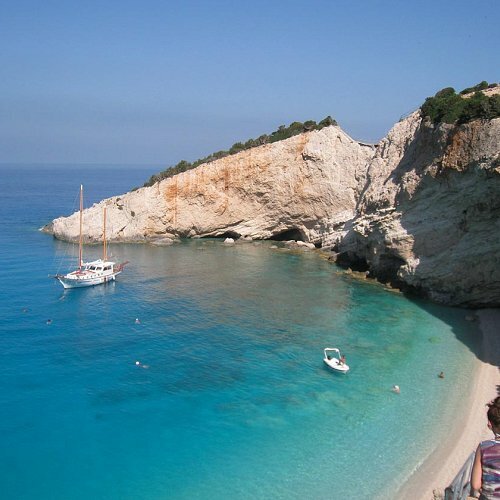 You can also fly to Athens International Airport and then catch a flight or coach to Lefkada. The recent construction of the beautiful bridge of Rio-Antirio has accelerated the travel by road from the capital Athens, 385 km away. If you are taking this route to reach Lefkada you must stop for refreshments at “The Garden of Eden”, a unique side road cafe owned by Kostas. It is on the right hand side of the road, 13 Km after you pass the above mentioned bridge, but you need to look out for it, as it is well concealed amongst trees - you will not regret it! If you were to travel on your own by car please be aware that there are motorway toll charges. Buses from Athens cost about 30 euros, leave regularly and take 5 hours and this might be a good way to get to Lefkada if you first want to visit Athens, as part of an extensive holiday. There are several buses per day to/from Athens. In Athens, the Lefkada bus operates from and to the Leoforos Kiffisos Bus Station. A taxi between the Leoforos Kiffisos Bus Station and Athens Airport costs about 35 Euros and takes about 40 minutes. 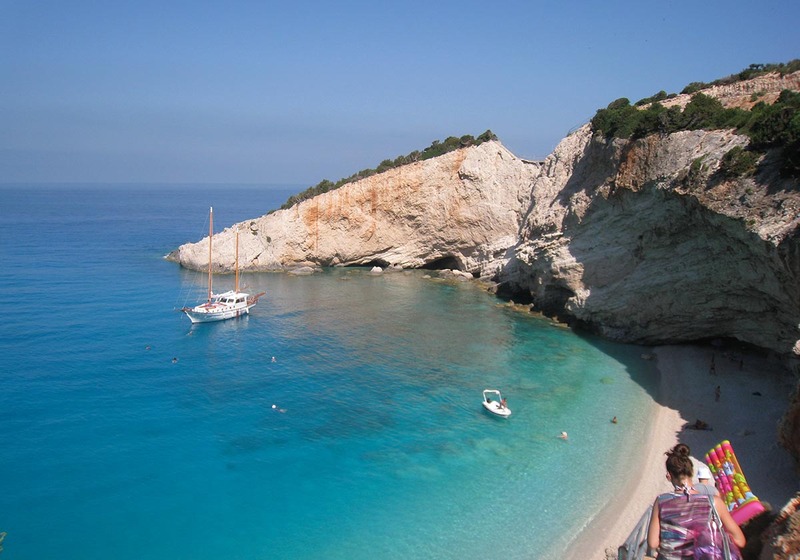 You can catch the local bus from the airport to Lefkada Town (the capital of the island). This will take approx. 25 minutes and the cost is 2.20 euros. From Lefkada Town bus station you will then catch a connecting bus to Nidri, a further 20 minutes ride and this should cost 2.20 euros. It may be possible for Big Blue to pick you up at Nidri and take you round the bay to the hotel, which takes just a few minutes. 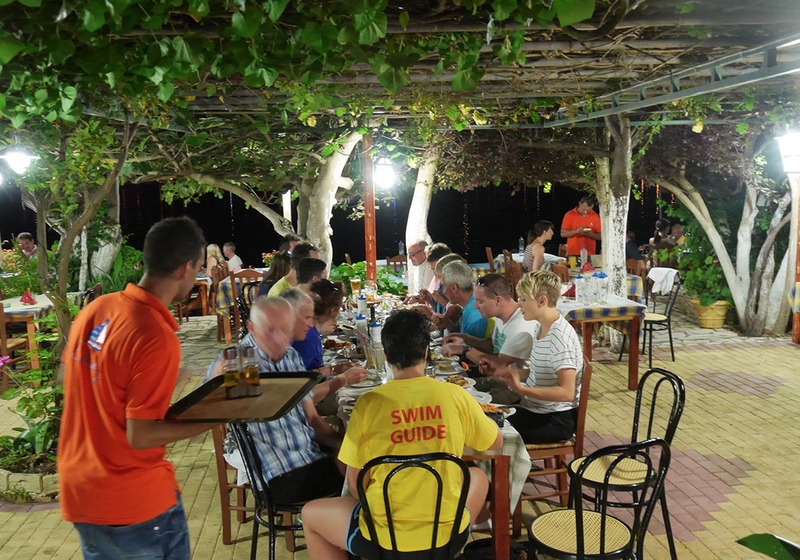 The individual rooms and apartments of the hotel are spacious with kitchen facilities and are situated amongst matured olive groves and well maintained gardens offering shade and a relaxed Greek atmosphere. Ilios Hotel is privately owned by a Lefkadian capable lady called Georgia who also resides in Italy. Georgia strives for excellence and high standards and the hotel and grounds are maintained and run by a number of professionally sourced and friendly staff throughout the year. Ilios offers a buffet-style breakfast, has wi-fi, a swimming pool and a poolside cocktail bar where swimmers can unwind and indulge in a drink after a hard day’s swim. 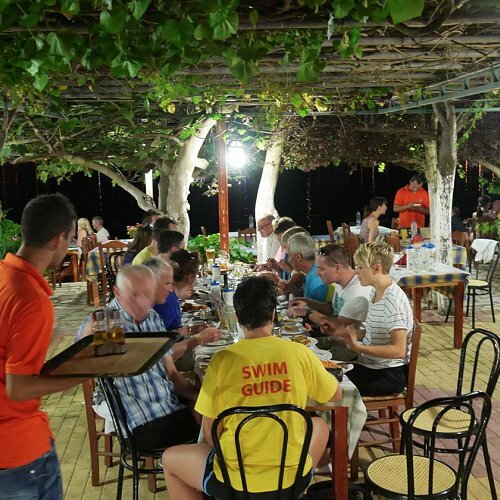 They also run a terraced restaurant with views across the water where Big Blue swimmers can have the day’s specialities at special discounted prices and a traditional ‘Greek night’ is also on offer once a week, usually on the Wednesday. 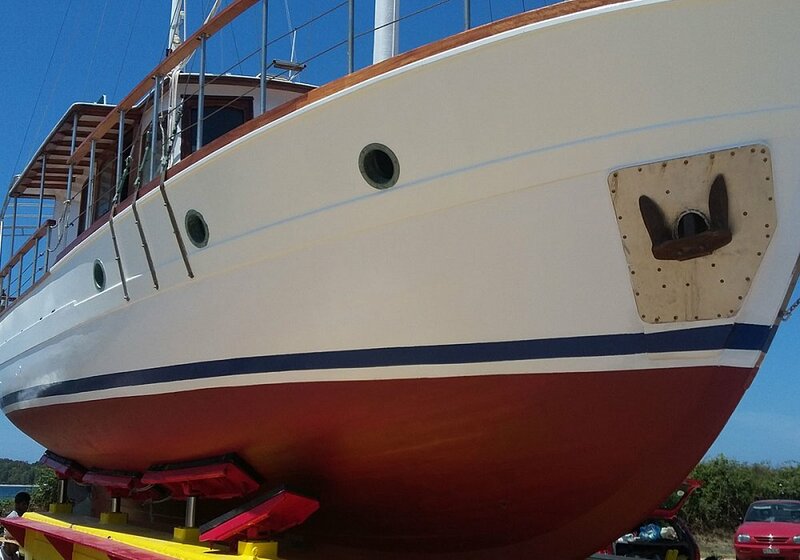 Although there is still quite a bit of cosmetic work to be done, everything on her works well, complying with all the latest and stringest maritime safety laws and offering speeds up to 13 Knots with her brand new 320HP diesel engine, ideal for cruising around the Greek seas. From the comfort of her ample teak deck and the huge bean bags especially purchased for lounging on, swimmers indulge under the welcoming Greek sun and peruse the diverse coastline of the Ionian Sea, in the gentle and unassuming luxury of Mowgli. The sense of achievement obtained from the big blue trip was immeasurable. We both felt uplifted and confident by the coaching and support we received. Jax and Jamie made us laugh and put us at ease, whilst reassuring us throughout the swims. Georgos and Stavros playing a vital supportive role too. I would strongly recommend the trip to all I come into contact with! The location and the swims were truly breathtaking and memorable for individual and unique reasons. The group members were like minded and easy to bond with. The accommodation and hospitality were faultless. It was clear this was a well planned and organised trip. The most amazing week of swimming in Greece. Well organised and totally enjoyable. Thank you to the team. It was one of the best holidays I have ever had. A fantastic week with fab guides and great company. Hotel also looked after us well. 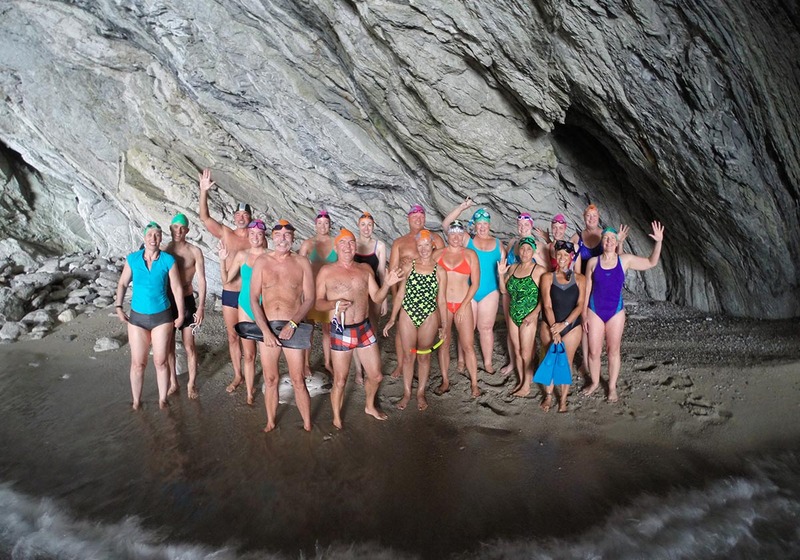 A great way to meet like-minded swimmy folk and enjoy a brilliant holiday! I loved every salty second, every sea breeze, every chunk of feta, every tub of Vas and I am counting the months until I do it again. This holiday is yours for the making. I loved it for the challenge, the people, Greece, the freedom, the laughs, the adventure. It was so much more than swimming. It made me feel alive. Michael and his team offer a very professional but relaxed week of swimming, safety is high priority but this did not interfere with the swimming. We loved it and will be re-booking for next year when we get home. The highlight was Zoe getting the swimmers ready, lots of laughs and fun. The new boat is terrific and makes the boat rides so easy and some people even went to sleep on the giant bean bags which are so comfy. 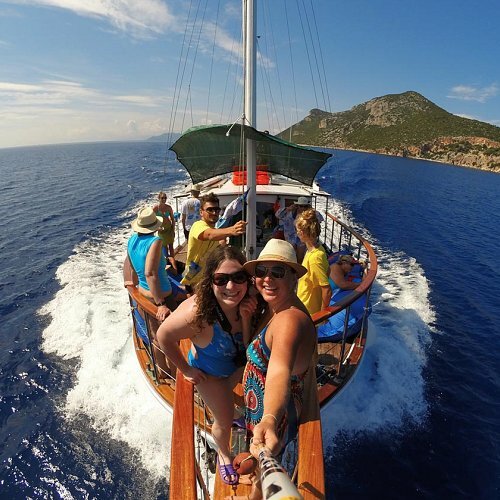 We made soo many new friends and every body looks after each other and this is a unique way to see the Greek Islands and there are soo many of them. We cant wait to do it all again in 2015. Congrats to The Big Blue a great experience with lots of fun.